With the stunning debut of the Mustang I concept in the summer of 1962 Ford had a problem, and became—in a sense—a victim of its own success. The little 2-seat, mid-engine sports car had generated tremendous excitement, but it was essentially a hand built experimental prototype sports racer with a tubular spaceframe, 4-wheel independent suspension, and a unique V4 engine that was not used on any domestic production model. New Ford boss Lee Iacocca had greenlighted production on a sporty little production car called the Mustang, but it would be based on Ford Falcon mechanicals and share virtually nothing with that original concept but the name. Ford needed to direct all the excitement over the prototype toward a more production-ready version of the Mustang, and thus the 1963 Mustang II Concept was born. Development on the production Mustang was well underway in preparation for its April 1964 release, so unlike the traditional concept car, the Mustang II would not shape the street car’s configuration—it would follow and foreshadow it. That was its purpose: to bridge consumer expectations and get the public ready to accept the production pony. The Mustang II Concept was actually built on one of the production Mustang prototypes by Dearborn Steel Tubing (DST)—a fabrication company Ford had used for this type of job previously. DST yanked off the bumpers and designed a special front grille and valence, establishing the corralled pony grille trim that would be such an iconic part of the production ’64 model. Special spear-shaped front fenders were designed and incorporated mesh-covered headlight recesses. In fact, that valence and the front fenders are all a single piece of steel grafted onto the front of the production-spec Mustang. The rear got similar treatment, with the rear cap being extended, the triple taillights elongated into the lower valence and quad exhaust tips extended through it. The car started life as a notchback hardtop, but DST sliced it into a roadster that mimicked the look of the production convertible, but no folding top was installed. Instead they built a one-off removable hardtop. Under the hood sat a largely stock 271hp Hi-Po 289 with a few tricks to enhance showmanship, like trick lifters specifically designed to make the Mustang rumble like a race car. Like the original 2-seater, the Mustang II was premiered at Watkins Glen—one year later, in the fall of 1963. It then went on the show circuit and a press tour until just before the unveiling of the production car in the spring of ’64. Once that happened the Mustang II went into storage and has rarely been seen since. But it remains a crucial piece of the Mustang history, and has a direct lineage to the beloved Ford that established the pony car genre and became an American icon that endures until this day. 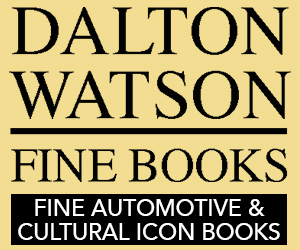 Automodello specializes in historically significant automobiles that have been neglected or overlooked by the model industry. 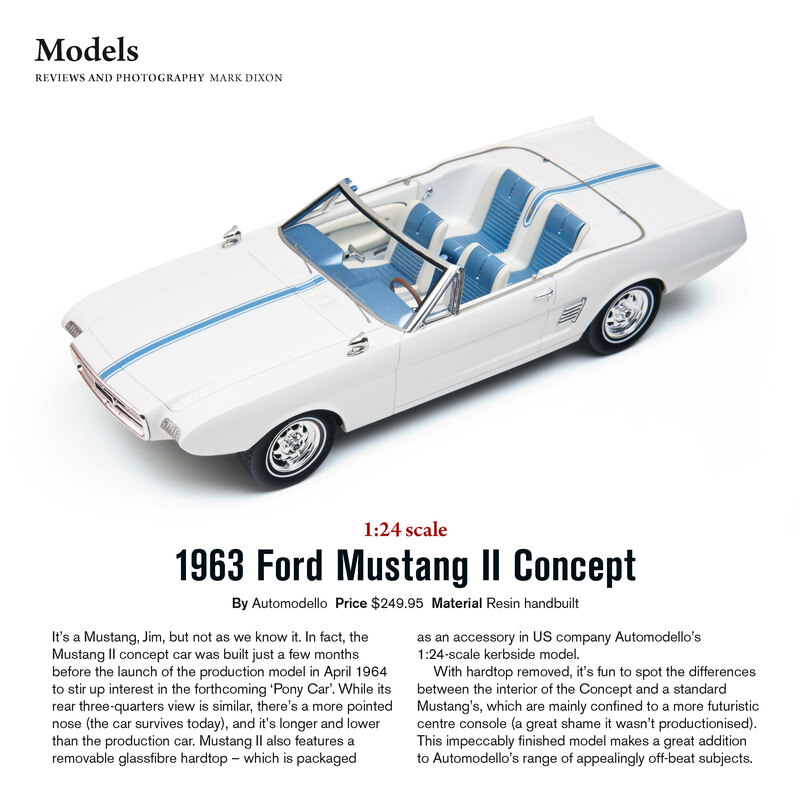 Working in close concert with Ford, and following its precision 1:24 replica of the 1962 Mustang I Concept, Automodello now offers collectors the chance to own another essential chapter of the Mustang story rendered in exquisite 1:24 resin with photoetched metal detail and trim. The Mustang II Concept, as it appeared in 1963 in white with blue stripes, will be produced in just 299 pieces as the Standard Edition, while a very special Tribute Edition specifically authorized by Ford comes to you in just 50 hand-numbered examples wearing Tribute Red. Congratulations on owning this very special, very exclusive piece of Mustang history. This model is eligible for Diecasm's exclusive Automodello 1:24 for 3 payment plan. Please see details here.